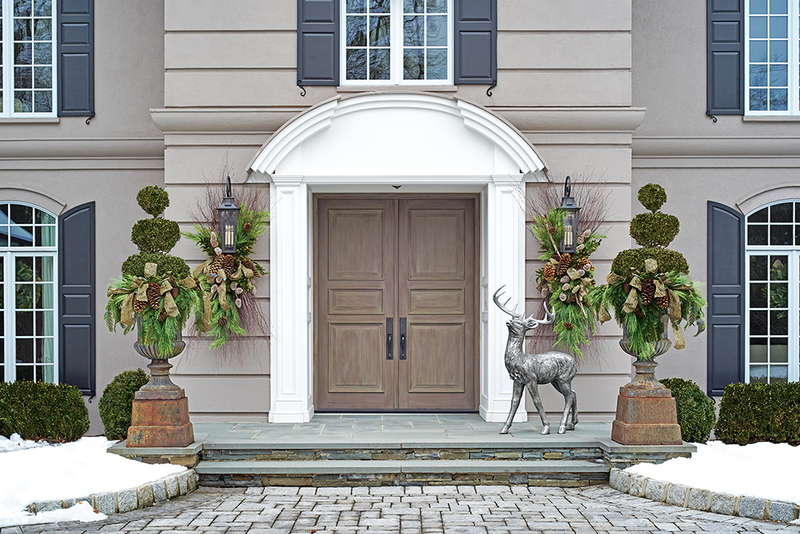 The seasonal décor at the front entrance of the French Manor-style home gives a nod to the woodland setting. Nature’s beauty in winter inspired the holiday décor at Alyson and Daniel Sugar’s home in Ho-Ho-Kus, New Jersey, last year. “I wanted the design to speak to and celebrate the winter season while being a more elegant version of the surrounding woods outside of our home,” Alyson Sugar says. At the front door, Policastro added two kinds of evergreen branches, natural pinecones and olive-green flocked ribbon to the topiaries flanking the door. Instead of a big wreath on the double door, she added evergreens, natural and frosted pinecones, birch twigs and the same green flocked ribbon to the lanterns on each side of the door. Sugar provided the pewter-color stag figurine, which adds subtle glamour. FOYER | A collection of mercury-glass trees on an antique table and garlands attached to each staircase post complement the clean-lined, serene atmosphere of the foyer. 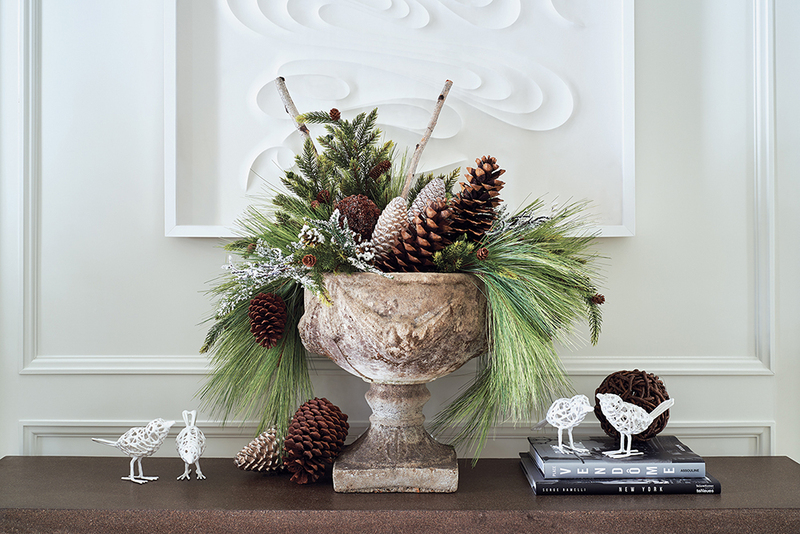 URN | A console opposite the foyer staircase holds homeowner Alyson Sugar’s stone urn, which Joanna Policastro filled with green and frosted branches, twigs and natural and glass pinecones. Meandering under the arrangement are four white doves from Sugar’s collection. The door itself was part of a total renovation the Sugars undertook after they purchased the home in 2015. Drawing inspiration from doors she and her husband saw on a stroll through the Left Bank in Paris, she designed new, larger doors that are more in scale with the home and are wire-brushed for an aged finish. The Sugars also redid all of the masonry on the exterior, simplified the trim and added fresh paint and new lighting. In the foyer, the woodland scene unfolded around an antique French oak elliptical table. Sugar’s collection of mercury-glass trees stood under a tall vase of evergreen and birch branches, two shades of blown-glass pinecones (pewtery silver and soft gold) and tan berries. Two battery-operated candles added no-fuss visual warmth. Under the table were two more of Sugar’s contributions: another stag figurine and a large antique sphere that she lined with LED lights. Rather than take the traditional route of hanging garland all along the staircase, Policastro suggested a simpler, more striking option: individual garlands that hang from each post on the staircase. They comprise evergreen and “snow-covered” branches; natural, frosted and blown-glass pinecones; and an elegant, soft-gold woven ribbon. “The garlands are not lit because the foyer is already very bright,” Policastro notes. Here and throughout, she chose faux evergreens so they would look fresh throughout the season. 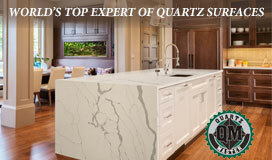 Each room was designed to entertain family and friends and make them feel comfortable. “The rooms are cohesive in nature, but each allows for an exciting and independent experience,” Sugar says. In the living room, for example, “custom-designed floor-to-ceiling cerused oak wall paneling is dramatic, “but the warmth of the smoked wood tones is at the same time very serene and inviting.” A layered Venetian plaster ceiling is reminiscent of a cloudy sky, lending what Sugar calls a sense of soothing moodiness. “This is the first place where friends want to gather for a cocktail in the evening,” she adds, “but also a great spot to collect a crowd on the oversized sofa to watch a movie or game on the mirrored television above the mantel. 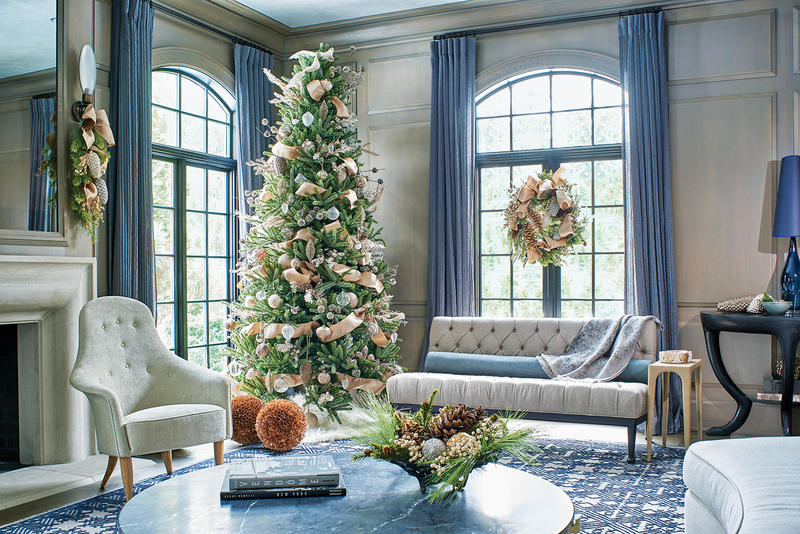 Complementing the neutral upholstery and blue draperies in the living room, Policastro decorated a ceiling-height Christmas tree with Sugar’s collection of silver, gold and clear orbs in different sizes and styles, along with sparkling marquise-shaped drops, miniature birds and bunches of silver berries. 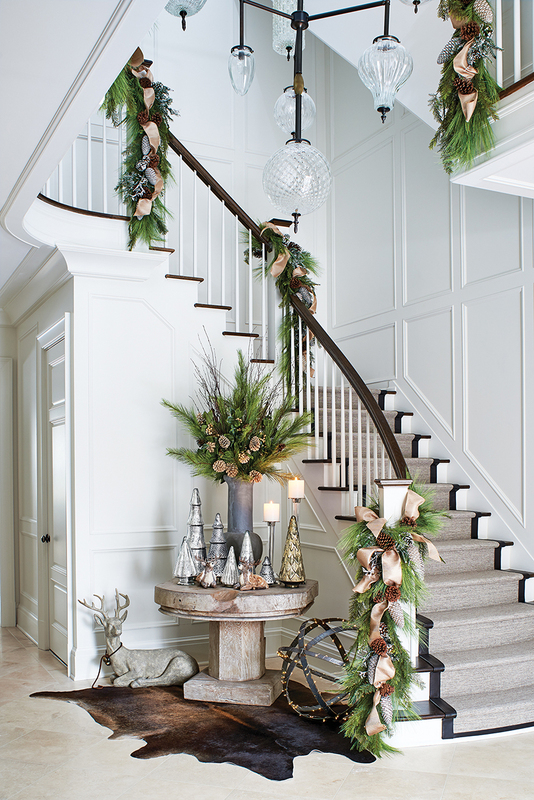 Pinecones and the same ribbon as on the foyer garlands tied together the two spaces. A wreath at the front window is dressed in natural and glass pinecones, gold ribbon and spikes of small metallic balls. Sconces on each side of the fireplace and a small bowl on the coffee table carry on the theme with evergreens, natural and blown-glass pinecones and tan berries. DINING ROOM | Dramatic aubergine walls and a striking wall covering above the wainscoting add a sense of wonder to the dining room. 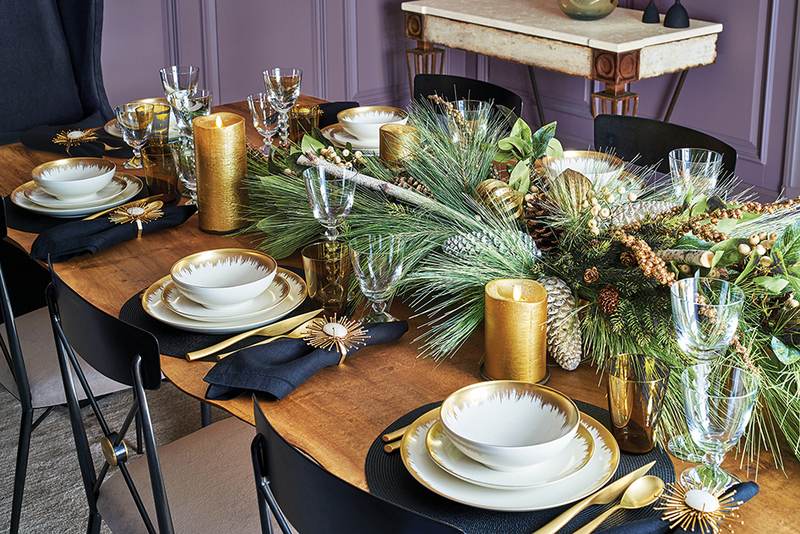 In the dining room, Policastro designed a table runner of evergreen branches, natural and blown-glass pinecones, tan berries and twigs plus spikes of tiny metallic balls to add an elegant sparkle. The table setting complements a room with walls, wainscoting and trim painted in a dramatic aubergine shade. “The dining room began as a color experiment for me, as I’m often quite timid with the use of color,” Sugar says. TABLE | An evergreen table runner with gold accents, gold pillar candles and gold-trimmed dinnerware create a festive ambience. 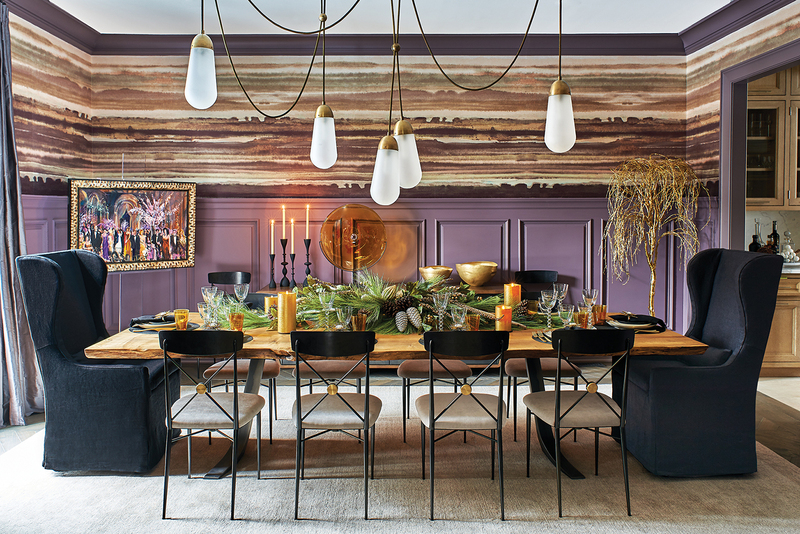 Overall: interior design, Alyson Sugar of Alyson Sugar Interiors in New York City; holiday décor, Joanna Policastro of Seasonal Surroundings in Waldwick. Foyer: French oak elliptical table, antique; custom chandelier, collaboration with Michelle James NYC in New York City; chocolate cowhide area rug and linen and leather stair runner, Starr Carpets in Englewood. Living Room: sofa, The Bright Group in New York City; small table beside sofa, leather from Ochre in New York City; dark wood console near window, Oly in New York City; blue lamp on console, Ochre; armchair by fireplace, Adam, a 1958 design by Swedish designer Kerstin H. Holmquist; marble and brass cocktail table, Gabriel Scott in New York City; wool rug, Tibetano in Englewood and New York City. Dining Room: table, oxidized maple slab with a wishbone steel base by Tod von Mertens in Hancock, New Hampshire; wing chairs at each end of the table, Restoration Hardware upholstered in black linen; other dining chairs, steel and brass by Jason Wu for Canvas Home in New York City upholstered in custom putty mohair; wall covering, Phillip Jeffries in Fairfield; chandelier, Apparatus Studio in New York City; bamboo silk/wool rug, ALT for Living in New York City; draperies, Holly Hunt in New York City.